Behind the Bit: Horse hair bracelets: Charming or creepy? Horse hair bracelets: Charming or creepy? I've never been 100% sold on the idea of making jewelry out of your horse's mane/tail hair. There is something about wearing-a-piece-of-someone-you-love that feels somewhere between taxidermy and "Silence of the Lambs." Hair is a powerful symbol, and horse hair is beautiful and natural and strong. Is it right to trivialize it into jewelry? Think what bugs me is the intertwining of horsehair with what I consider to be finery -- and have you looked at what some of these things cost? At Dressage At Devon some of the booths I visited used diamonds and precious metals, at a cost of as much as thousands of dollars. The natural beauty of hair with the artifice of high end jewelry? It's not for me. I say this knowing jewelry is a matter of personal taste, and others may feel differently. 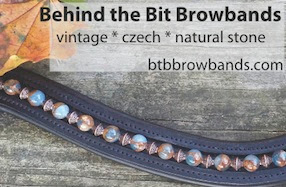 Enter at A has made a horse bracelet I can embrace -- coupled with leather, and with a simple design that parallels what you see in a quality bridle, the leather and hair just "fits." It's sporty too, you could wear it with jeans and the kind of clothing horse people tend to wear. I'd own one, and in fact soon I'm going to sacrifice a bit of Harv tail to have one made. And to top it off, its TWENTY BUCKS. It's not "trivializing it into jewelry" for those of us who have buried an equine we loved. It's a memory better than a photograph and more physical than a video. Hi Anon, no offense intended. It's just my opinion and I certainly understand that others have different views. Well horsehair is one thing, check this out! http://equinite.com/ I want a bracelet of my Dani's hair but am also liking this hoof clipping idea. Once cleaned and processed it looks like tigers eye and other natural stones. Perhaps it could be odd thinking about it but I love the idea of having my Daenerys with me where ever I am. Those are cool bracelets too! Every time I had put down a beloved old horse or pony - three times so far - I have cut off a substantial hank of hair from the tail. Once, when the knacker came to pick up the dead body, I said, "wait a second I want to cut some hair off his tail." I asked if she thought it was a little weird and she said people do it all the time. (Yes, the local livestock removal business is operated by a woman.) People usually intend to incorporate it into a horsehair bridle, or braid it into a keepsake. Horsehair jewelry is not my thing anyway but I have no problem with making it into a piece of tack. I don't have a problem with it. I've had a hat band and a pair of earrings made with a special horse's tail hair. What is worrying is the trend to buy horse hair items with horse hair that is not from your own horse. Because running out of horse hair is an issue, it is becoming a worry for people who go out to check on their horses only to find that someone broke onto their property and cut off their horses' tails! I have two bracelets made with silver clasps and silver bands from my deceased equestrian partner. I was not able to bury him or have him cremated and it horrified me that because of particular circumstances he was just going to be considered medical waist. I was able to forever remember him through two simple bracelets that I wear in remembrance of all that he gave me, taught me, and did for me. It was the least I could do. Ooooh, those are bee-yoo-ti-ful! Very classy. I have no issue with regular horsehair jewelry, however (at least the plainer kind without excess bling). In fact, I actually made my friend and I matching necklaces out of tail hair from her WB a couple of years ago. I taught myself how to 4-strand braid, purchased simple silver hardware online, and already had the pendants. I find it very comforting and will be glad I have the talisman when her boy crosses the bridge. I would love one of these bracelets and think you'd be glad to have it. I have a bracelet I got made with my horse's tail hair. He's still around, but I still wanted something to show how much he means to me, I guess. Mine is pretty simple, though, just his hair braided and a simple clasp (his tail is black and white so it makes a pretty striking design all on its own). I don't see anything at all wrong with using your horse's hair to make something to remember them by and if diamonds and silver are your thing, well...go for it. I do think it's a little odd to wear someone else's horse's hair (like a pre-made piece of jewelry). But I guess if you just want something unusual or 'horsey' you might go that route, particularly if you don't have a horse of your own. I think that I am also on the fence about horse hair jewelry. A horse that I know was humanely put to sleep this summer, but before he went to the grave almost all of his mane and tail were sheared for trinkets. I thought that this was disturbing and made the horse look not himself. I guess there are always extreme situations that take things too far. I have a bit of my beloved "Golden Poo's" tail hair tied with a narrow ribbon and inside a picture of her as a puppy. I don't know that I'd wear a bracelet of horse hair--but I'm not much of a jewelry person anyway--a watch, a pair of earrings and I'm "good to go." Keeping a bit of hair in the picture frame, however ... that's more my style. I bought a bracelet made from the hair of a famous (and now deceased) racehorse to benefit ex-racehorses. I never thought of it as creepy. I thought of it as beautiful...and practical. It's nice to think this benefits these all-too-often castoff horses. I don't believe it is creepy at all. When I had to put my horse down after 25 years I removed some of his tail before he was put down. They aren't human, after all. People make products from animals. You could take hair from the horse still alive and make these. What's weird is people that would classify this as "disturbing." I'm on the fence about it... I guess maybe because I haven't yet had a horse that has a) died and b) meant enough to me to take a hair sample... I could see taking a bit of hair from a long time companion that meant a lot to you and having it made into something, but I don't think I would wear it. I, too, am on the fence about horse hair jewelry. When my horse died my husband collected hair from his tail. Three years later I still can't bring myself to open the box. Eventually I may have something made from the hair. I'm glad that I have the option, but it still makes me feel sad. Liz - I know exactly how you feel. I have hair from my darlings packed away but I cry if I look at it. I don't have that much reaction to the box containing my dead husband's ashes. I'm sure there is also some touching cowboy poetry about making a bridle from some beloved horses tail. Hello! Thank you for posting! Most of the bracelets I have made are from horses that are still with their owners. I only use hair given to me by my clients for their own bracelet. I will ask friends if they would donate a little extra hair if I have someone who would really like a bracelet for a sentimental reason, but do not have the hair. I do have some styles with sterling silver and beading, but came up with the leather style because it is fun! I am wondering what people think of the people in the Victorian era who made rings and braclets from their lover's/fiancees/spouses hair and wore them?